Journalists, journalism, print and electronic media-Radio and television rightly called fourth estate next to Legislature, Judicature, Bureaucracy. They have a noble role to play and by and large they play their role very effectively. They by their free and fair reporting enhance the reputation of the individuals or institutions. Newspapers big and small in the area of circulation or the number of copies circulated, carry a lot of messages for the readers. I have personally experienced the joy and worth of such reporting on ourselves or others. This week’s Sunday Story carries the recent experiences with the Press and Envius Thoughts. 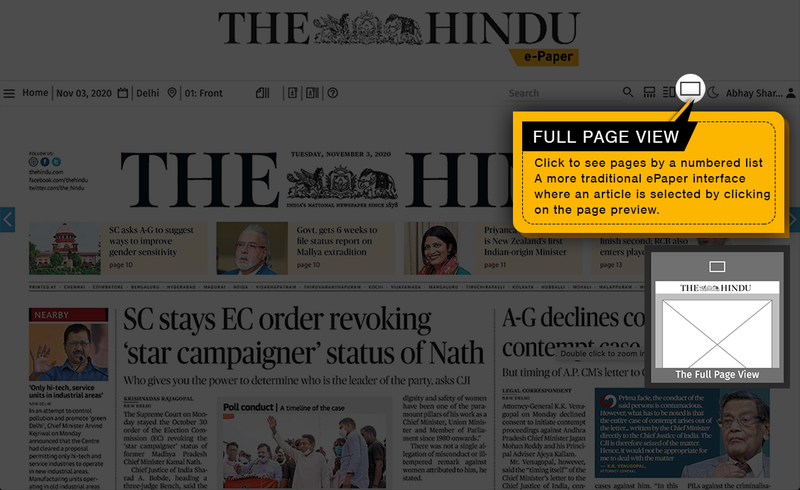 We have national news paper of century old THE HINDU and several neighborhood newspapers called Anna Nagar Times, Anna Nagar Talk, Mogappair Times, Mogappair mail Tamil magazines of repute “KALAI MAGAL”, “KAVITHAI URAVU”, “ILAKKIYA CHOLAI” and so on. They frequently carry some interesting information on my work and Envius Thoughts which creates a new circle of friends and acquaintances. and I feel very rewarding to me a sensitive person. Friends and others in my colony and outside speak to me over phone or in person; they say they feel elated whenever they see some news on me and this Blog.Naturally it plunges me in pleasure! Let me share a few thoughts with my esteemed viewers. When a review of my Tamil translation of Telugu Thyagabrammam’s Pancha Rathna Keerthanas to Tamil was reviewed very positively by the HINDU a lot of inquiries were made. I can quote quite a few examples in the Hindu and other magazines. Would like to confine for the reasons of brevity the latest one. Anna Nagar Times of June 24th, 18 carried the following news with the photo of the blogger. ——————————————————————————- Avid Blogger achieves 1.5 lakh hits. 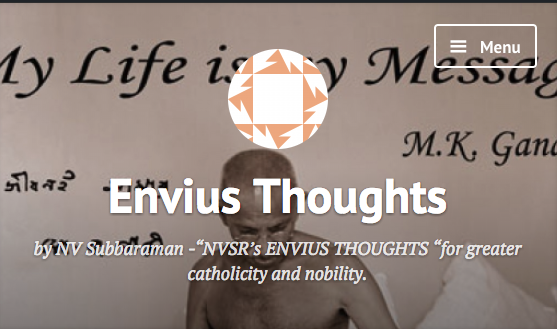 N. V. Subbaraman (resident of 12/1045, Jeevan Bhima Nagar, Anna Nagar Western Extension) is an avid blogger who has been actively writing on his blog page “Envius Thoughts”at “https://nvsr.wordpress.com”since February 2015 and has so far written 1262 blogs in 1209 days. His web page followers in 210 countries and it achieved 1.50 lakh hits on June 20th. He told Anna Nagar Times that he writes an English poem daily from Mondays to Saturdays and a story on Sundays.He has also posted translations of Thirukkural, Bharathiyar’s works,and Tagore’s Gitanjali in English in his page. His name is featured in “Asia Book of Records” and “India Book of Records” for writing a record number of 1055 blogs in 1000 days. He had won the ‘Versatile Blogger’ and the Liebster’ awards from WordPress Bloggers University in an online contest in 2015. He is also the Editor of the online portal ‘Young Poet’.Subbaraman retired as Deputy Zonal Manager from LIC. Having seen this, my colony people felt that they are proud to be having me in their colony and they are happy to say that they are my co residents in the Jeevan Bhima Nagar!!!!!!!!!!!!!!! After seeing the news, a stranger-now turned a friend- talked to me over phone, expressed his joy on knowing about me and conveyed his desire to meet me at 4 pm. Prompt came Mr.S R Rajagopalan, aged 86 Retired General Manager in one of the TVS group companies, a nice writer in Tamil -has about 6000 pages of writing in beautiful hand writing on several topics of interest to youth and elders. He is also having a consultancy for the youngsters who would like to go for higher education abroad! On seeing the Anna Nagar Time one more Mr Kumar highly appreciative of the Blog. He observed-”A new concept within the Visual communication. Neat work by you. “ He had a golden idea to suggest through the Blog for the viewers to adopt CALF OF A COW AS PET. All have to enjoy harmonious joy and happiness,and peace! Parrots and squirrels, cats and dogs are the pets of pet- lovers! Calves of today are cows of tomorrow-called GOMATHA fine! Yet can try outside the building in the open space around! With the pets we find pleasure in fondling with our palms. Adopt the calf of the cow as pet and enjoy make it famous! Let us adopt calves and give to farming community later! He has also organized planting 4500 saplings to become great trees towards greener world! Recently there was a special achievement. Palasu is a vedic spiritual tree, whose dry branch/ stems are used as samithu. We had planted 4500 plants which is unique. Can you cover.We had planted. N V Subbaraman,resident of Jeevan Bima Nagar, Anna Nagar and former deputy Zonal Manager, LIC of India,was recently included in the Asia Pacific Records for ‘the longest -running blog. On his Blog ‘Envius Thoughts’ (https://nvsr.wordpress.com) he made 1270 posts in 1217 days on trot. He did not take a break, even for a single day.His blog has more than 1, 52,000 viewers from around 210 countries. Every Sunday, he posts a Sunday Story. On the other days, he posts English poems. Subbaraman is a bilingual poet, speaker and writer.He says he is an avid reader of The Hindu for the last seventy years and a regular contributor to the Letter to the Editor column. In the late 1970s, more than 100 of his letters were published in the paper. He has so far authored 37 books including translated works such as Thirukkural,Bharathiyar’s poems, Bhagavan Ramana Maharishi’s Akshara Mana Malai (Tamil to English) and Rabindranath Tagore’s Gitanjali, Japanese Poet Daisaku Ikeda’s poems, and De. padmanabhan’s poems into Tamil. He has translated Thiruvaiyaru Thyagabrammam’s pancharatna keerthanas from Telugu to Tamil and brought out in the form of a CD. This news brought out a good number of responses over phone, emails and whats app messages from the known and unknown. I felt as if a Nobel Prize has been awarded!!!!!! That indeed are the magnificent and electrifying effect of the press coverage. With this we end this Sunday story and we shall continue. Thanks till then goodbye! ENVIUS THOUGHTS crosses 1,55,000 views. I am glad to share with you that with the 1st view at 00.30 hrs today viz Sunday the Eighth (08th) July 2018 , total views of the BLOG crossed ONE LAKH AND FIFTY FIVE THOUSAND (1,55,000) from more than 210 countries around the world on the 1226th day and 1279th post, thanks to your support and encouragement. Kindly continue. GLOBAL FORGIVENESS DAY 7th July. Anna Nagar Times over The Hindu! Birds talk over Trees’ talk! Yet, NVS Sir is only for ENVIUS THOUGHTS! The Special Sunday Story is more attractive by enhancing its views to 155000! Thanks for your poetic response, Vasudevan.